 Buying table tennis rackets – The straight and honest racket advice!  Table tennis bats for beginners - What to pay attention to? You have your own ideas about how your racket should be built, and look like? You want to have individually customized rubbers and/or a blade? Well, in this case, our racket configurator is the perfect tool for you! Table tennis blades: Choose your brand, and check out the manufacturer specifications. you can also find information regarding speed, control, weight, and price. Table tennis rubbers: Choose the brand, and check the manufacturer specifications regarding speed, control, etc. 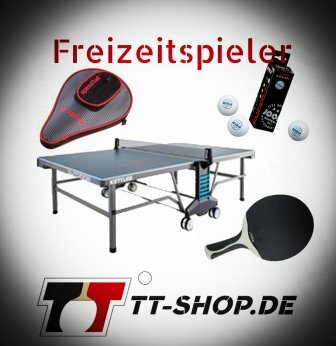 The focus of this category lies on all kinds of equipments, which the table tennis player needs in order to perform this sport. 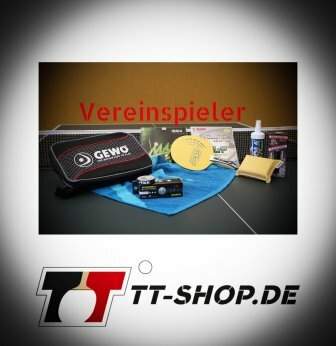 Starting from completely mounted table tennis bats to individual rubbers and blades, here you can get everything your heart desires. Via the bat-configurator you can also put together your own, customized table tennis bat. Table of all table tennis rubbers: Read through relevant data regarding velocity, spin and control of all rubbers, sorted by brands. Table of all table tennis blades: Read through relevant data regarding weight, veneer structures and control of all blades, sorted by brands. How may we assist you? Just give us a call or email us, we´ll reply quickly! The articles and categories of this page were especially designed for clubs. Wishes and preferences of clubs are, however, very special: Sometimes score sheets are needed, sometimes printed samples of jerseys of various brands and in larger quantities. 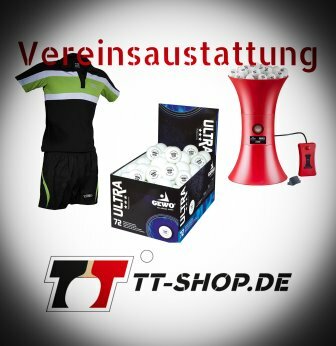 Although TT-SHOP.COM cannot cover the whole spectrum of a wholesaler in stock, we can order and deliver almost all articles of all table tennis brands within 2-5 days. Are you responsible for a certain section in table tennis? Are you responsible for youth work, new jerseys, training balls or other equipment? The contact with clubs is very important to us. What do you need to improve your club? We support voluntary work and would be very happy to hear from you soon! We are also happy to answer your questions with respect to any concern in the field of table tennis equipment. Usually we answer your e-mails within a very short time. You can also call us and we would be very happy to get to know you! Are you interested in table tennis? We offer the perfect equipment! Joola blades are often recommended as inexpensive products when starting in a table tennis club (e.g. the Mikado series). Many players stay with that brand even after a significant improvement in the game (for example the Rosskopf series, or TPE). One thing is for sure: There is something appropriate for every type of player. The company Joola generally refrains from giving each article a speed and control value in the form of numbers. By the way, Joola makes no secret of the detailed veneer combination used for their TT blades. The overview table below contains all manufacturer specifications, including information regarding the veneers of the Joola table tennis blades. Green fields symbolize blades which can directly be ordered at TT-SHOP.COM. Of course, the other blades can also be ordered. For this, please do not hesitate to contact us via Email! Delivery times are indicated, or will be available - just ask us. We wish you lots of fun and good luck digging through! What is immediately noticeable is that the table above does not contain values of speed, spin, or control. Normally, indicating specific values regarding this is quite common. Instead, Joola provides insights into the structure of the layers and plies, which is more informative for players. Soft wood types (for example Balsa) result in an INCREASED amount of control. Hard / stiff materials (such as Carbon), in contrast, make the whole blade faster. At the end, each single Joola TT blade is a unique specimen. Hence, it is important to inform yourself, and to try! MCS - Multiple Compound System: This is a special gluing technique of the veneers. The individual plies are glued in such a way that they exhibit a good control, and - simultaneously - good acceleration characteristics. RAG: Round-About-Grip: This is a kind of honeycomb structure within the handle, which integrates the whole blade into the handle. This considerably reduces and absorbs unpleasant and disturbing vibrations, resulting in a good control, and an increased feedback at ball contact. The RAG technology was especially developed for Joola. Flow adhesive: This technology is known from aircraft construction, and makes it possible to form very hard veneers into a vibration-free blade. Junior blade: Due to a smaller head of the blade, and a shorter handle, these Joola blades are ideal for small children´s hands. Carbon: This material results in an increased speed, enlarges the sweet spot area (= the location where the ball should hit the racket. At the sweet spot, there are ideal gaming properties), and reduces unpleasant vibrations. Carbon CS: This leads to an extra portion of catapult, and spin! Meliorate Carbon: This is an extremely tear-resistant and hard Carbon fabric. It also enlarges the sweet spot area, and simultaneously improves control. WSI: = Wing-Shaft-Integration-Technology, which is a wing-shaped handle reinforcement. BRUNtec: This technology leads to a distortion-free and warp-free blade. In addition, the remaining moisture was removed. Balsa technology: This is a soft and light wood, with a very typical feeling, and much control. Texalium: Joola TT blades containing Texalium (aluminum-coated glass fiber fabric) exhibit a good acceleration, and a large sweet spot area. Most players prefer a flared handle type. This is true for approx. 85% of all table tennis players. Hence, all Joola blades are available with a flared handle. Most of them are also available with a straight handle. Straight handles are suitable for those TT players who have larger hands. Anatomical handles are probably the least common used ones. However, many Joola TT blades are also available with anatomical handles. In case you are an adult and want to purchase a Joola blade, you should estimate at least 24.90 Euro. This is a really good and fair price, considering that table tennis blades are used for life by many players. Even if not, you usually don´t change your blade within the first 4 years. Quality has its price. The better the quality of the wood & layers, the more expensive the product. With respect to Joola table tennis blades, the TPE series is particularly worth a recommendation. But also Rosskopf blades exhibit a long lasting tradition, and are very popular. Joola Black Rose - THE Swedish recommendation for controlled attackers! Joola Aruna Off+ - Our recommendation for the extreme offensive! Joola Rosskopf Fire table tennis blade - Speed for the Offensive! Joola Rosskopf Force table tennis blade - 3+2 veneers for a brutal offensive!